Is Donald Trump Moving Us Toward A Gold Standard? A few weeks back, an article by Hugo Salinas Price crossed my desk, discussing “Triffin’s Dilemma,” which I found of theoretical interest. But given time constraints I read it quickly and then put it on the back burner. But the concept of theoretical suddenly changed to extremely important when my friend David Jensen called me to suggest that there is a method to Donald Trump’s seemingly mad economic and geopolitical policies including tariffs and the reversal of the Iranian nuclear deal that Obama orchestrated. Moreover, David is convinced that Triffin’s Dilemma not only explains Trump’s political success and the reasons for his policies but that we may be nearing a massive tectonic shift in global markets as a result. Trump became President because he appealed to the forgotten middle class, most of who live in what elite snobs of both political parties refer to as “flyover country.” They happen to be mostly white and, whether Republican or Democrat, more conservative. Many of them used to vote Democrat but because Democrats have learned to rely on immigrants and a growing number of Marxist-indoctrinated college youths, they have largely forgotten about the interests of middle class white Midwesterners. That is a very large group of people hurt very badly by a massive loss of wealth-creating jobs in manufacturing and mining. The standard of living has plunged since the early to mid 1970s primarily for people in the Midwest. The question is, why? The Trump Tariffs go into effect today, July 6, 2018. Raising tariffs will most likely result in fewer imports into the U.S., thus reducing the flow of dollars overseas in payment for goods purchased from other countries, most notably but not exclusively, China. Thus, less dollars available for CBs. The Federal Reserve’s Monetary Policy – David pointed that Chinese banks have now borrowed some $2 trillion from offshore sources and then lent them back on shore in China. 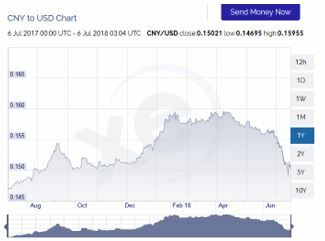 With U.S. rates rising and the Chinese currency falling nearly 6% since April 11, 2018 (see chart above), Chinese borrowers of those $2 trillion figure to face a heap of pain now as major losses mount. To the extent Chinese banks are hustling to repay their U.S. dollar debt, the demand for dollars and hence its price vis-à-vis the Chinese currency rises all the more, thus leading to a virtuous circle of increasing Global U.S. Dollar Liquidity (GUSDL). David’s point is that $2 trillion is likely too big a problem to be bailed out by central banks via swaps, as was the case during the 2008-09 crisis, though the Peoples Bank of China did in fact intervene on July 3 to drive the value of the Yuan up a bit, relative to the dollar, in an attempt to stop this bloodbath for Chinese banks. Indeed, over the past several months, a shortage of dollars has been a growing crisis in various emerging market countries, most notably Argentina. But the Chinese problem is potentially much, much larger. (Note Chen Lin’s remarks on page 11 regarding a possible financial crisis in China). Keynesian economist, this was monetary policy run amok. Ever since, these Keynesian elites have been attempting to dial back their insane money creation and they will continue to do so by reducing or eliminating monetary stimulus until the system blows up once again from a lack of sufficient liquidity to meet debt obligations. Again, David’s view is that with the $2 trillion of U.S. dollar debts owned by Chinese banks offshore and with the dollar gaining over 5% against the Chinese currency in the last two months and with interest rates rising, insolvency starting in China and other emerging markets is pretty much a foregone conclusion. David has now caused me to pay close attention to my 52-week GUSDL like a hawk. 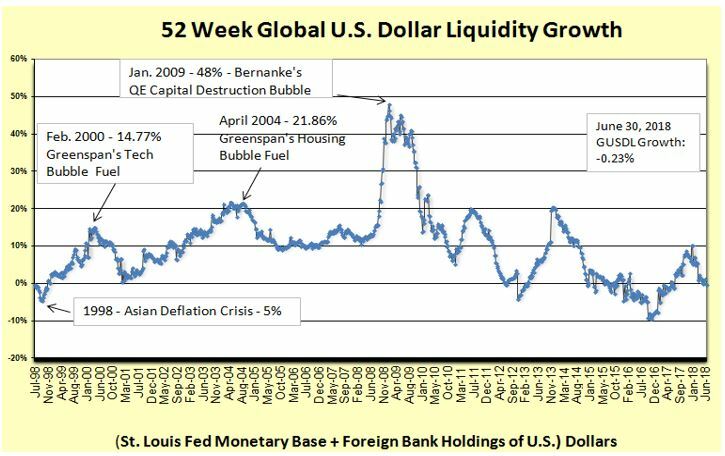 I started charting this after the Asian Liquidity crisis, which in many ways looks a lot like this emerging crisis, though this one is a magnitude larger and thus much more dangerous. Hugo Salinas Price concludes in his article: Mr. Trump apparently does not want to have foreign CBs use dollars as Reserves, by making it very difficult to obtain those dollars – which they can only get if the US runs a Trade Deficit. “The unexpected result of Triffin’s Dilemma, has been the de-industrialization of the US, as the world geared up to undersell all US producers wherever they could do so, in order to obtain the indispensable US Dollars. “There is one way, and only one way, to do away with the Trade Deficit and renew the productivity of the US: abandon the present International Monetary System (derived from the original Bretton Woods Agreements of 1944) and return to the gold standard. “There are no “Trade Deficits” under the Gold Standard, because all countries have to pay Cash Gold for their imports, and collect Cash Gold for their exports. Result: Balanced Trade. No Trade Deficits. Nixon removed gold from the dollar in 1971. Shortly thereafter, Secretary of State Henry Kissinger arranges with Saudi Arabia and OPEC to demand oil exports be paid for only in U.S. dollars, thereby ensuring demand for dollars. The Federal Reserve, now being able now to create endless amounts of dollars in the absence of a gold standard, swarmed the global economy with trillions of dollars that were absorbed by CBs. The S. led the global community toward “free trade.” In appearance it seemed the U.S. aggressive free-trade posture in which it was cutting tariffs more than other countries were was a “kind” act. But in fact, it was part of the new policy’s need to ensure the U.S. ran deficits to ensure sufficient liquidity remained in foreign CBs to keep the dollar as the world’s reserve currency. How would you like to be able to enrich yourselves and your elite friends by printing money in your basement? Well that’s exactly what the U.S. Government does and its “legal.” It’s fiat! The winners in this game have been America’s ruling elite who occupied the Military Industrial Complex, American socialism, and banking systems. With endless amounts of money now available for socialism, combined with affirmative action and all manner of other discriminatory policies, a Democratic party under Clinton and Obama prevailed, as did mainstream Republican elites under the two Bush Presidents. Republicans became known as the “Warfare Party” and Democrats as the “Welfare Party.” Eventually, neo-conservatives won over the elites of both the Democrats and Republicans. Everyone who benefitted from war and socialism has been happy with the direction of things since 1971. The losers in this game were America’s middle class, most of who live in flyover country. They are largely America’s forgotten class of God-fearing, conservative, mostly white middle class. The jobs of these people were sacrificed for the benefit of what is truly an anti-America policy of discrimination against an entire class of people by government and its ruling elite. For the dollar to remain the world’s reserve currency and thus enable endless amounts of money to be created out of thin air to benefit the elite, monetary and economic policies had to result in massive trade deficits that in turn resulted in massive unemployment of the middle class that led to Trump’s election. As Hugo Salinas Price points out, the only way to fix this chronic trade deficit and therefore the return of jobs to nations that run chronic trade deficits is to return to the gold standard. David Jensen makes a point that with Chinese banks now owning US$2 trillion off shore, and with the dollar gaining significant ground against the Chinese currency and with U.S. dollar interest rates on the rise, we may be very near the next global financial market collapse. Trump was elected by the forgotten middle class who live in flyover country. He wants to create jobs for them by having an even playing field for global trade. He wants to get along with Russia and China so that the world can trade and grow rather than fight constant wars. That’s exactly the opposite of what both Democrat and Republican elites desire. The elites from Harvard, Princeton, and Yale climb the social and economic ladders by joining think tanks that make excuses for the U.S. spending trillions of dollars on “defense” used to demand economic concession from foreign countries and gain control over their sea lanes. In the process, over the last couple of decades we have killed hundreds of thousands of innocent men women and children in the Middle East and have turned the world against the U.S. and NATO. The political battle now in the U.S. is between the elites of both Republican and Democrat parties that have benefitted from a fraudulent monetary system and President Trump whose policies are attempting to overturn this very corrupt system. All political hell has been waged against Trump because of his very ambitious endeavor to return America to its principles of a nation under God, indivisible with liberty and justice for all, without regard to race creed, or color. Whether he will succeed or not, or what the Presidents true motives are, only God knows. But one thing is for sure. The traditional ideal that I think he stands for is equality under the law, not guaranteed outcome for all. In any event, Triffin’s Dilemma is a reality and unless we move toward an international gold standard and as long as the U.S. dollar (or any fiat currency) dominates global trade, chronic deficits and loss of jobs will be the telling pathology for the nation that owns the reserve currency. When you hear all the media malice toward Trump and his tariff policies, keep Triffin’s Dilemma in mind. And also watch what is taking place in countries that are preparing to trade in a monetary system based on gold. I’m speaking of course of nations that the U.S. is most hostile toward, such as Russia, China, Iran, and North Korea. And now we are seeing how the U.S. dollar as reserve currency is in the process of leading to economic pain in Europe as well. Whether David’s concerns of an inevitable global crisis resulting from China’s $2 trillion off shore debt become reality remains to be seen. But it is safe to say that given global fiat money, we are living in an increasingly debt-ridden, insolvent world that will lead to another round of chaos. The only earthly solution of course is to return to a commodity-based monetary system, the most ideal of which would be gold. It may be heading our way sooner than you think.